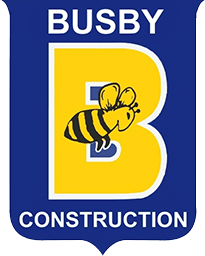 Busby Construction Co., Inc., was founded in 1977, as a site, utility, and service company. Located in Atkinson, NH, the area of operations extends a radius of 150 miles including New Hampshire, Massachusetts, and Maine. Busby Construction Co., Inc. operates out of its commercial site located on 12 acres at 71 NH Route 111 in Atkinson, including the 80’x125’ construction garage and 40’x50’, 4,000 s.f. office building. Both states of the art facilities were constructed in 2012. Busby Construction Co., Inc. is prequalified with New Hampshire & Massachusetts Departments of Transportation to bid and execute projects. The company is fully insured and bonded by an “AAA” ranked surety company. The heavy equipment and vehicle needs of the company have grown along with the number of employees and volume of work being completed. The focus of the company evolved from traditional contracting methods to be very proactive in the recycling/reclamation methods. In the mid-1980’s a division for asphalt, reclamation was established. Currently, the company reclaims in excess of 900,000 s.y. of asphalt during its roadway and parking lot reconstruction projects. Busby Construction Co., Inc. continues a very aggressive approach to means and methods which are “green” for our environment.